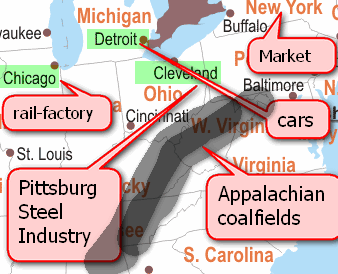 Since most of the coalfields are located in the middle-latitudes=> iron-steel industry developed here. Since steel is the raw material for many secondary industries (heavy/light engineering, machine tools, automobiles etc.). => Important industrial regions of the World usually found @middle latitudes. On the other hand, tropical belt doesn’t have any significant coalmines => hardly any industries belts. Africa doesn’t have coal or iron ore (Except some parts of S.Africa)=> hardly any industrial development. Raw material Staffordshire, Warwickshire coal field.Although, nowadays iron smelting industry moving towards coastal locations for imported iron ore.
Transport Central location=>Dense network of railroads. Automobile: Coventry= HQ of British Leyland company. Cars, coaches and trucks. Raw Material Sweden has one of the richest iron ore resources of Europe. Although they mostly rely on German pig iron as we saw earlier, due to lack of coking coal. Energy Mountainous terrain + fast flowing river= abundant hydroelectric power (HP).Cheap HP=electric furnaces @steel plants, and electro-chemical industries. Stockholm’s connected to Gotebore via Gota Canal = easy transport and export of engineering products. Other industrial towns well connected by railways, roads and inland waterways. Market4steel Volvo cars, bofors guns, Electrolux refrigerators etc. Kuznetsk basin in Western Siberia = rich coal deposits- sent to Ural region by Railways. The returning wagons after emptying coal, bring iron ore from Ural region. Thus iron-steel industry developed @both places. This is known as Ural-Kuznetsk combine. Market4steel Agricultural machinery, because Agriculture developed in Central Volga region. In the late 19th century, in Britain, the coal production and urban industrial growth occurred parallel. Same story repeating in China. The railways was in nascent stage and lacked the capacity to move massive quantities of coal to industrial areas. Various regions of China did not have interconnected electricity grid. Therefore, many industrial regions were setup in North, near the coal mines. Coal from Shantung and Shensi. Runs along with the Yangtze river, Around Chongqing, Wuhan etc. Coal from Chongqing + hydro electricity from Yangtze river. Iron ore deposits on South of Yangtze River. Yangtze river itself provides cheap inland transport. At the end of 1950s, Chairman Mao had started a campaign called “Great Leap forward” with the aim to transform agrarian Chinese economy to industrialized economy (similar to Russia). One of the tool under “great leap forward”=backyard furnaces. Peasants did not have the skills for metallurgy, work was done in haste, sometimes villagers would just melt their kitchen utensils and product an unusable metal lump meet ridiculously high steel production ‘targets’ given to each commune. Steel produced by such backyard furnaces was very weak and non-uniform in quality. If you made any machinery or building with this substandard steel, it would breakdown in a few years. Farm laborers were shifted to collect scrap-metal and cut jungles for charcoal=>agro productivity declined and led to famines in later years. Forests were cut down to make charcoal => environment problems, soil erosion etc. even upto final rolling and shaping of ingots and rods. takes years to construct an integrated steel plant Low gestation period. in India, they’re concentrated in Damodar Valley region (Eastern India) They’re usually away from areas having integrated steel plants (Western India), to meet local demands + to avoid competition from integrated steel plants of the East. Note: maps for most of the following steel plants are given on page 88 and 89 of NCERT Class 11 (India People and Economy), do refer to it. Labour Abundant supply of Cheap labour from Jharkhand, Bihar, Odisha and the tribal belt of Chhota-Nagpur platteau. Secondary industries located in the region that use steel to manufacture machine tools, automobiles, agro-machines, tine-plates, wires etc. Consumer cars /SUVs like sumo, safari, indica, sierra etc. and heavy vehicles, including armored carriers for army. sludge-slag from the plant provides raw material to Sindri fertilizer industry. Setup in 1907, just two years after Lord Curzon partition Bengal. Manganese is used for hardening steel. Labour No shortage of cheap labour. itself uses steel to make rails, beams and other structural products. Main location factor= Government policy to setup plant here, to remove backwardness of this region. just 40kms away Baba Budan hills, in Chikmanglur. Bailadila mines, Odishalocal iron ore also available- has low phosphorous-sulfur content=>helps making special grade Iron and Steel. In early days, used charcoal from forest wood. located on main railway line of Biru-Shimoga. billets, rails, wheels alloy steel and sleepers for railways. Salem steel is useful in TN’s automobile industry, elevators, lifts, coins, ceiling fans.Also caters Government mints (for making coins). Started in 82. Location chosen due to political considerations. Transport Vishakhapatnam itself a Port= rail connectivity with other states.+ helps in import of raw material and export of final products. trivia First shore based plant of India. examples kitchen utensils, refrigerators, vacuum cleaners and variety of home and office appliances. shipbuilding, railway wagons, hydro turbines, thermal generators, transformers etc. location Can afford to transport steel over longer distances and therefore scattered in distribution. Need large quantities of steel => located fairly close to iron-steel industry to reduce transport cost. But main factor is: transport cost for heavy and bulky raw material (steel)=> Heavy engineering industry is usually located near steel plants. Earlier we saw that steel plants themselves are located in the Damodar Valley and surrounding region (WB, Odisha, Jharkhand) for easy availability of iron ore, limestone, coking coal, energy and cooling water. Now let’s see examples of how heavy engineering industry is also located in the same region, because of those steel plants. Chittaranjan Locomotives: steel from Durgapur (~70 kms) and hydroelectricity from Damodar Valley. For the list of heavy industries in Foreign countries, we already saw the examples in those industrial region tables above. HMT Hindustan Machine tools.has units in Bangalore, Pinjore (Haryana), Ajmer (Rajasthan), Srinagar etc. Observe that none of above places are famous for iron-steel production. Such industries rely on electricity rather than coal or oil for power. For them skilled labour, transport, market, favorable government policies (SEZ/Taxation) are more important factors than proximity to raw material. They can be found near major cities rather than in traditional industrial areas near coalmines. We’ll see about them in detail later in the articles for market/labour factors in industrial location. In the next article, we’ll see geographical factors affecting the location of automobile industry and shipbuilding industry. Thank u so much sir……after reading ur articles I like generstudies…. plese sir write a articles about relevent of weberian industrial location theory in india. thanks you sir for the article . . sir you mentioned that tropical regions doesnt have any significant coal fields , but India and Australia have coal fields in good number . can you please clarify it sir . thank you . what a lovely superb Post.